Despite being Italian, I have ventured into making home-made pizza only in my late twenties. I think the reason is partially found in the fact that living in Italy it is so much more convenient to get really delicious pizza from an actual pizzeria, also considering that most pizzerie in Italy have a stone oven with real fire. Which is, in my opinion, the key element to producing a real good pizza and not just an okay pizza. An electric oven will never deliver the same result, as delicious as it may turn out. Yes, I’m very conservative. Thus said, at home I’m stuck with a “normal” household electric oven, so every time I make pizza I have to face the fact that I will never reach the level of professional pizzas. Yet, trying to get closer and closer to that level is a good target in my pizza making adventures. If I can do little to fix my oven issue, I can always work on making my dough better and better. Over time I have developed different recipes for my pizza dough. The best recipe I have is from a former coworker from my Polish days, but that procedure requires time, as it involves the making of a sort of sourdough that needs to sit overnight. 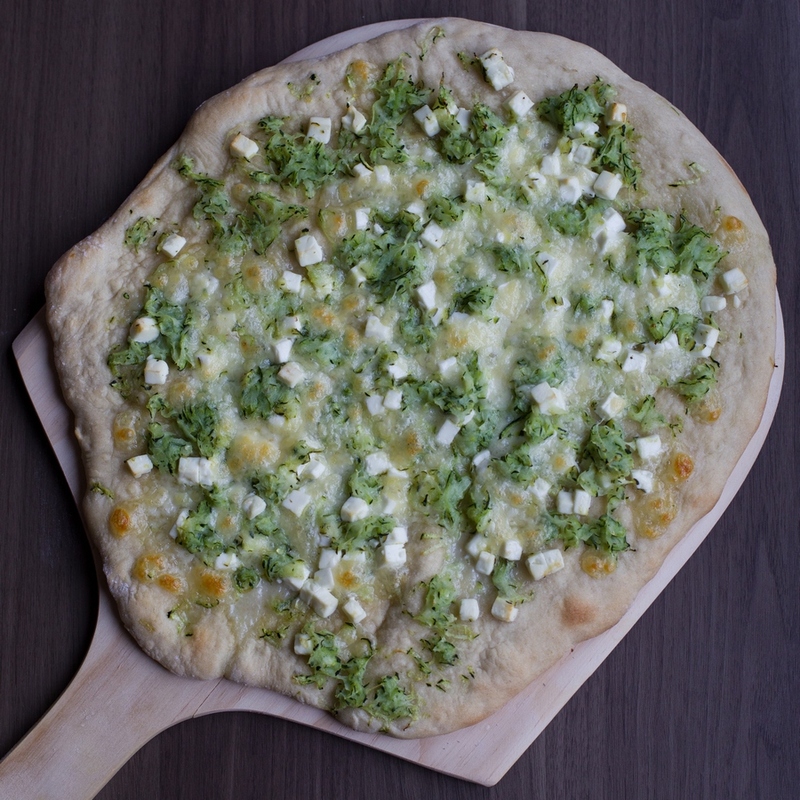 Then I have an easier one, a time-cheating pizza dough recipe that yields an equally satisfying crust, for those times when you just want to have pizza for lunch or dinner on the same day and you don’t have many guests to serve. Pour 150 ml of warm water in a cup. The water should not be very hot, but still warm to the touch. Add the fresh yeast (I use the one that comes in a cube) and a ½ tsp of brown sugar and mix until dissolved. In a large bowl measure 250 g of flour and make a well in the centre. Slowly pour in the yeast mixture and start stirring it in with a spatula. Just before it starts forming into a dough, add the olive oil and salt. 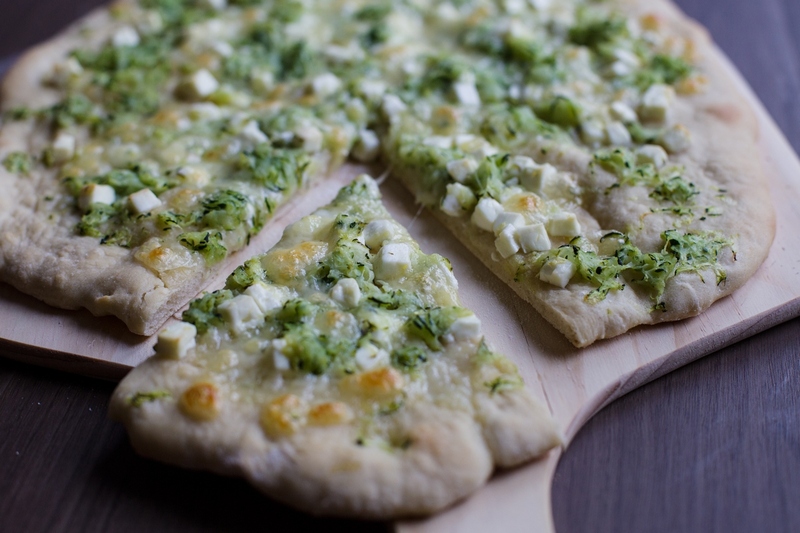 Now set the spatula aside and knead the dough with your hands. It should be fairly easy to handle, not too hard. If too sticky, add some flour to the countertop until it won’t stick when pressed down. Put the dough ball back into the bowl, cover it with cling film so that it doesn’t dry out and then cover it also with a towel to keep it away from the light. Let it rise for one hour. While the dough is rising, it is a good time to take care of the zucchini. Grate it and let it sit in a strainer until it is time to be put on the pizza. 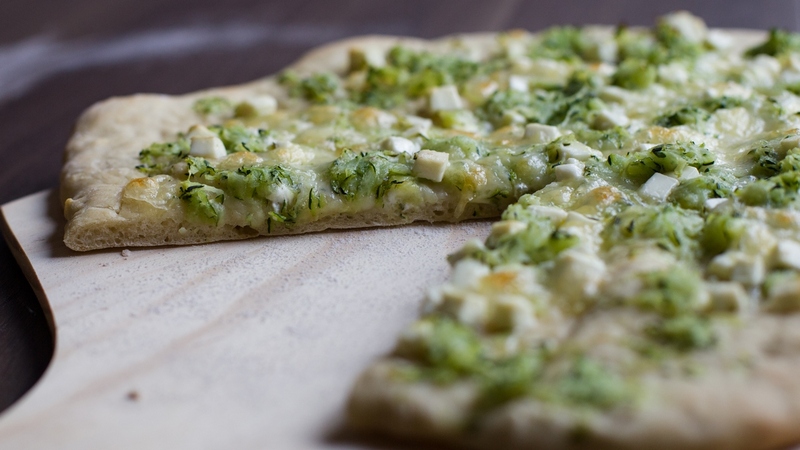 The zucchini tends to release a lot of water, and we want to prevent it from bleeding on the pizza. Left on the strainer it will discard the excess juice. I like to do the same with mozzarella, as I don’t like it when it releases water on the pizza. So I diced my mozzarella and left it over a paper towel. Lastly, I diced the feta. This is also the time when I turned on my oven and started warming up my pizza stone. I wanted it to be properly hot. Now, the longer the dough is allowed to rise, the better. 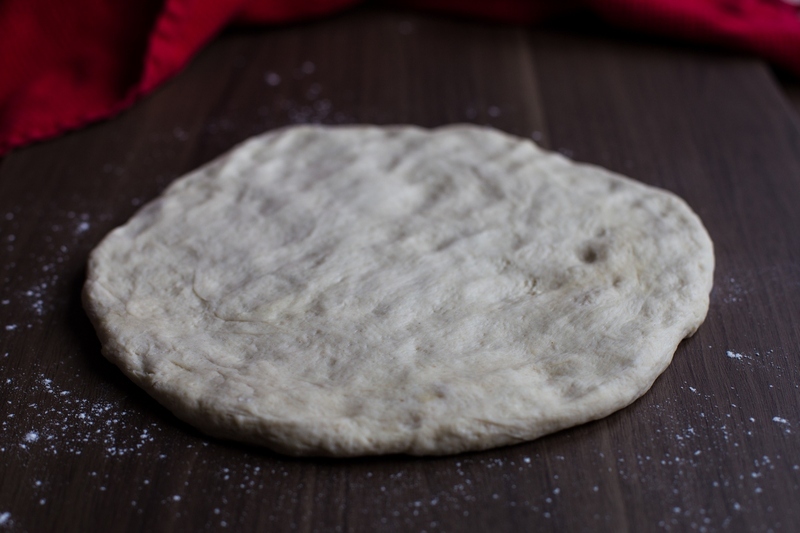 But already after one hour it will be ready, so take it out of the bowl and flatten it into a round thin crust. Since I bake my pizza on a round stone, I tried to stretch my dough into a circle as big as the stone. Sometimes I like to stretch it more and make it thinner, but then I usually bake my pizza in an oven tray because it will become larger than the pizza stone. I have never learned to toss the pizza dough around like a real pizza master, so I usually flatten my dough with a rolling pin. No, it’s not cheating, it’s just a different way of doing it. 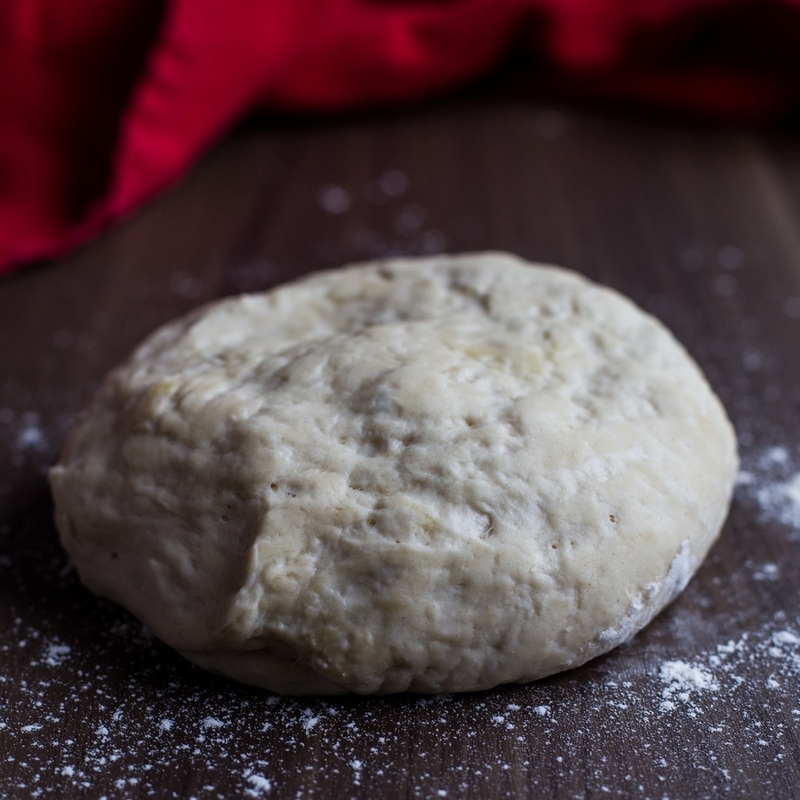 Pour a couple of tbsp of olive oil onto your dough and spread it with a brush. 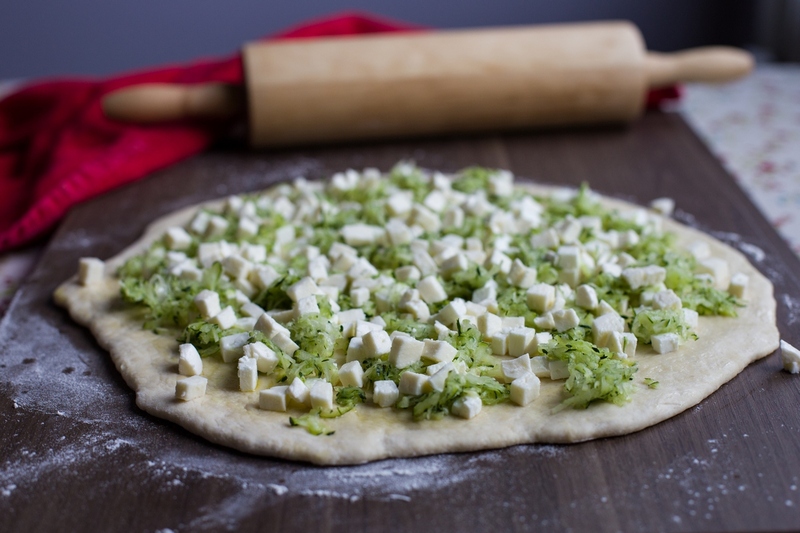 Add the diced feta, then distribute the zucchini (make sure to squeeze them some more just to make sure to get rid of all the water), lastly add the diced mozzarella. Bake for about 20 minutes at 220°C. 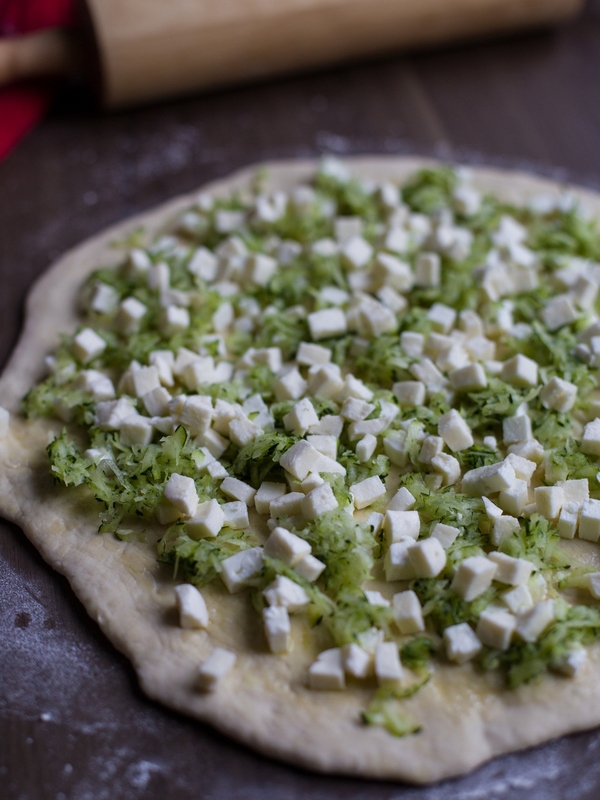 The mozzarella will dissolve, but the feta will keep its shape. This crust is really nice. It gets crispy on the outside but stays nicely soft on the inside. Adding 10 g of salt it turns out savoury enough to counterbalance the sweetness of the mozzarella and zucchini, in a pizza that otherwise would have only the feta to give it a salty flavour. This is not the typical pizza I’d eat back home, but I really enjoy it. The first time I made it I was kind of improvising with random ingredients to please a vegetarian guest and the result was so surprisingly good that it became a regular.